What types of maps are included in the Map Catalog? How do I find out more information about each map? What software must be installed on my PC to view these maps? How do I get a list of available maps for my town? How do I zoom the map in and out? How do I pan around the map? How do I display a map on my computer at the map scale the information is intended to be used and printed? How do I print the entire map on my standard printer? How do I print a small area on my standard printer? I have a large format plotter. How do I print the entire map on my plotter? How can I obtain full-size printed (hard) copies of these maps? Can I save these maps on my PC and view them later? Can I save any additional documentation for each map on my PC? Can I turn layers on and off in the map? Can I print a map with only certain layers turned on for display? Are these maps similar to some of the map themes in the Simple Map Viewer? What type of orthophotography is available for Connecticut in the Map Catalog? The Map Catalog includes a series of maps that describe Connecticut's environmental and natural resources. Each map series focuses on a particular map theme or single topic such as wetland soils or aquifer protection areas. These maps are typically available by town, but some are available for individual USGS topographic quadrangle areas as well as statewide. In the Map Catalog, click on the Town, Quadrangle, and State tabs to list the maps available for each category. For starters, each map includes a description of the map legend and data sources used to generate the map. This provides enough basic information to understand and use the map itself. For additional information and links to other related online documents, open the corresponding Data Guide listed next to each map in the Map Catalog. The Data Guide describes the nature and purpose of the information shown on each map along with any limitations on the use of the information. 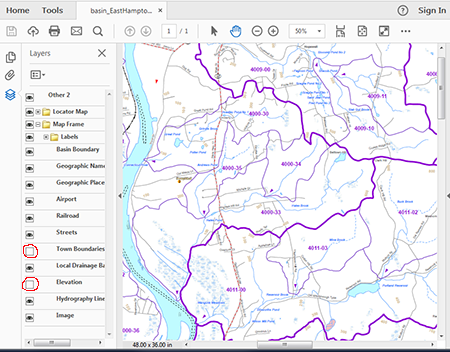 The Data Guide also includes links to additional documentation including the CT ECO Complete Resource Guide for a more thorough description of the map legend and GIS metadata for learning about the underlying GIS data used to generate the map. What software must be installed on my computer or device to view these maps? These maps are in portable document format (PDF) and require Adobe Reader. They should open in most web browsers. To list the thematic maps available for a given town, click on the Town tab and then either select a town from the small map of Connecticut towns or choose it from the drop down list. The name of the town you selected is shown above the list of map names. There are two basic ways to zoom the map in and out. One way is to alternatively use the following two buttons. Another way is to use the Automatic Zoom menu to pick the zoom percentage. The higher the percentage, the more the map zooms in. Drag the horizontal and vertical scroll bars at the bottom and to the right of the map. The scroll bars are shown in red below. Alternativiey,enable the hand tool to pan around. Set the percentage scale to 100% as shown below. Save the pdf map to your computer. Some browsers will download the file automatically to your downloads folder. In some cases, the pdf will open inside the web browser and then you need to download and save it on your computer. Be sure you have Adobe Reader on your computer. If you don't have it, download it for free here. .
Open Adobe Reader (which might be called Adobe Acrobat Reader or something similar). From inside Adobe Reader, open the pdf. To do this, select File menu > Open and find the pdf on your comptuer. It should now open inside Adobe Reader which will give you more printing options. 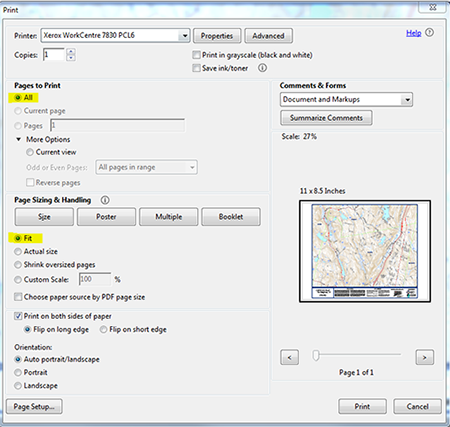 With the map open and viewable in Adobe Reader, press the Print button to open the Print window and make the settings as shown below before printing. 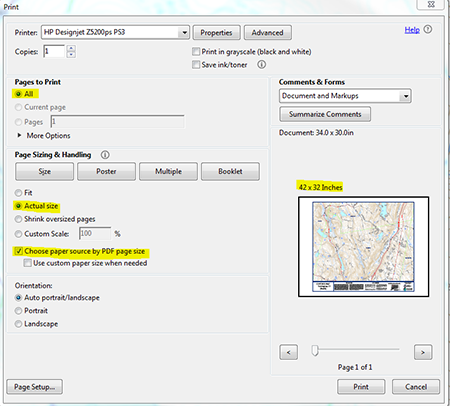 Be sure your open your map in Adobe Reader (instructions in the question above). 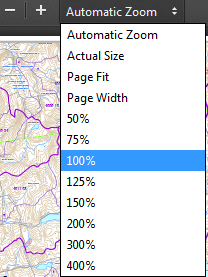 In Adobe Reader, pan the map to your area of interest and then use the Percentage Tool to view the map at 100% so that it is displayed at the scale it is intended to be used and printed. Press the Print button to open the Print window and make the settings as shown below before printing. Press the Print button to open the Print window and make the settings as shown below before printing. 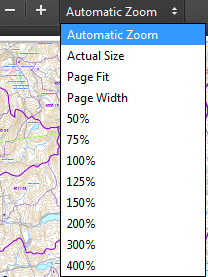 You will also need to specify a page size although this diaglog varies by plotter. Contact the DEEP Store to purchase printed copies of maps from the Map Catalog. Most maps are printed at 1:24,000 scale and measure 48 inches by 36 inches. The dimensions of each map are listed in the Map Catalog. The DEEP Store is open Monday to Friday from 9:00 AM to 3:30 PM. Yes. Once a map is opened, use the File > Save to save the PDF document on your PC’s hard drive. You can then later open the map by double clicking on the saved file in Windows Explorer, for example. 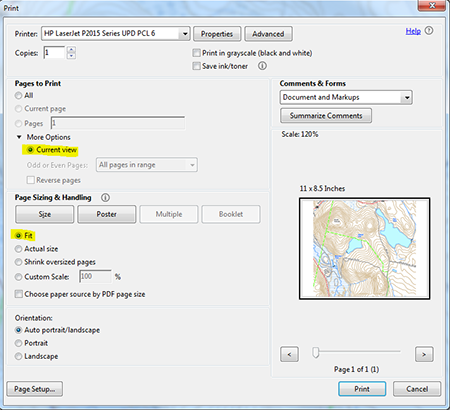 The filenames for each PDF map indicate the geographic area the map encompasses and the type of information shown on the map. 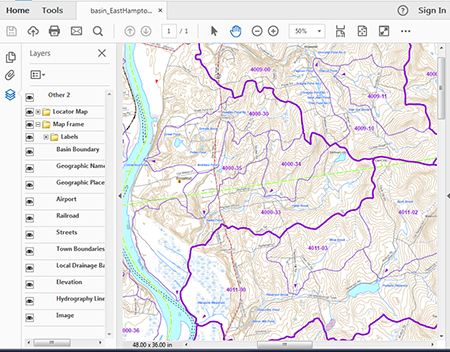 For example, a map file named Avon_nddb.pdf is a map of Natural Diversity Data Base Areas for the town of Avon, and one named Avon_basin.pdf is a map of the Natural Drainage Basins in Avon. Yes. In addition to a Data Guide, some maps in the Map Catalog include a Complete Resource Guide, which is more thorough than the Data Guide and in PDF format so that it can be saved on your PC along with the map. First open the Data Guide listed next to the map in the Map Catalog and scroll down to the Additional Documentation section and look for a link to the corresponding Complete Resource Guide. Open the Complete Resource Guide and use the File > Save to save the PDF document on you PC’s hard drive. 1. First press the Layers button (circled in red below) to open a list of layers included in the map. 2. As an example, below is the list of layers included in the Natural Drainage Basins with Contours map. Notice the eye-like layer icons circled in red to the left of each layer name. Click these icons to turn layers on and off. 3. Below is an example showing two layers turned off - Town Boundary and Elevation. Notice the eye-like layer icons next to these two layers have been clicked off, indicating the corresponding layers are not shown on the map. Yes. Use the same technique described above for turning layers off and printing. Yes. There is a strong correlation between the types of maps included in the Map Catalog and the map theme choices available in the Simple Viewer. The maps in the map catalog can be saved on your PC and used later while offline, whereas the Simple Data Viewer is an online tool that includes more capabilities including the ability to zoom the map to a particular street address and overlay the thematic information on orthophotography. Photography taken during the summer is generally referred to as "leaf on" orthophotography, and photography taken during the early spring is generally referred to as "leaf off" photography. Leaf off is captured immediately after the snow cover melts and before stream levels rise and leaves blossom on the trees. It is ideal for observing features on the ground surface in developed, open or wooded areas. The leaves on trees and shrubs that would normally obstruct the view from above during the summer are largely absent in the early spring, allowing for the observation of features such as stone walls, roads, and structures in wooded areas, lawns and yards. Refer to Connecticut Digital Orthophotography for a list and brief description of orthophotography available from CT ECO.